Executive head of the organization as well as controlling authority of all departmental activities. Dhaka South City Corporation, Dhaka. Collect solid waste from domestic, business, hospital, street, public toilets and drains.. Provide dustbins and other receptacles for accumulating the waste. DCC cleaners clean the roads, drains and sewerage lines. Collection and transportation of medical waste. Construct the Foot Over Bridges , Underpasses and Develop Low Lying Areas. Take the Necessary Action for the Proper Lighting of the Public Streets. Take Necessary Steps for the Watering of Public Streets for Comfort and Convenience of public. Plant Trees on Public Streets and Other Public Places. Implement the all Kinds of Development Plans. Construct and Repair of Public Markets and Infrastructures of DSCC. Improve the Traffic Signaling and Related Works. Coordinate With Ward Commissioners, Govt. and other Agencies. Security of honorable Mayor, CEO & DSCC’s Assets. Give Temporary Permission to use of DSCC Land for Religious cermony, Worship, Meeting, Fair and Cultural Activities. Disinfection activities during Eid- U-Azha as or when necessary. Clinical service Through hospital, maternity centers and charitable dispensaries. Register all Births and Death within the area of the city. Laboratory tests of food sample to detect adulteration through Public Health Laboratory..
Veterinary activities like supply of healthy animal meat, registration of pet dogs, legal action against illegal meat seller. 1st Floor, Nagar Bhaban, DSCC. 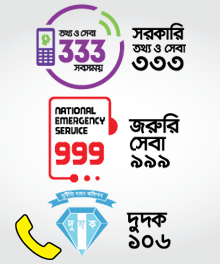 The ICT Cell of Dhaka South City Corporation is the youngest department of the Corporation. This department is introduced with the objective of application of Information & Communication Technology (ICT) in the planning & day-to-day operational activities of both the Corporations in order to increase the productivity, dynamism & transparency in the functions and as a result providing more quality services to the city dwellers. * Supporting DSCC on any Information & Communication Technology (ICT Cell) related activities like holding tax automation, birth certificate automation, HRM & Payroll automation etc. * Establishing Geo-database and other databases in order to support planning and decision making process of DSCC. To examine the personal file of the employees of DSCC. To suggest the authority for any bills of the customers, time scale and promotion of the employees. To examine and evaluate of the revenue income and it's supervision. To give the written the audit report central store and mechanical store of DCC to the authority. To do the internal audit for the development project of DSCC. This department is working for Dhaka South City Corporation of its establishment of right, title and interests with respect to legal aspect of person and property. It manages to contest the quick legal disposal of suits through its panel Advocates of the corporation in any case in the Court of any level. This department passes legal opinion for case of any legal difficulties whenever any department of the City Corporation requires so for its internal management and for the settlement of legal question between City Corporation and the mass people or any institution within its jurisdiction for the municipal service and facilities. Divorce matter and permission for second marriage of Muslims by religion be decided, settled and allowed by the RECONCILIATION COUNCIL, the delegated power and functions of the Honorable Mayor be exercised like manner by the CHAIRMAN of the COUNCIL the ZONAL EXECUTIVE OFFICER, in accordance with the MUSLIM FAMILY LAWS ORDINANCE 1961. To collect the newspaper cutting of DSCC related news. To submit the press clippings to the Mayor and Concerned Authority. To publish all kinds of notices and advertisements in the Daily newspapers and other media’s on the behalf of DSCC. To develop all kinds of awareness programs for the city dwellers of Dhaka City. Correction of Records in case of Transfer of Property. Issue Trade License for the Business Community of Dhaka. Issue License of Non Motorized Vehicles. Collect Rent from DSCC Owned Market. 1st Floor, Nagar Bhaban, Fulbaria.Dhaka-1000, Bangladesh. Housing and shelter for the slum and squatter dwellers. Provision of Micro-Credit for Self-employment and income generation activities, based on their existing skills. Management of the Graveyard, Cemetery (Burial Ground) and Soshanghat. Promote Physical Culture and Encourage Public Games and Sports. Organize Eid Jamaat at National Eidgah at the Ward level. Celebrate the National and Special Days. Establish, Manage and Maintain Welfare Homes, Asylums, Orphanages, Widow Homes and other Institutions for Relief of the Distressed. Organize Rallies, Tournament and Cultural Festivals. Execute and Undertake Rescue and Relief activities during Natural Disaster . Ensure Security & Service to passengers. Management of On-Street Car Parking. Road naming and Name Plate Setup. Represent DSCC in National Exhibition. Site Development Scheme includes Development of Sites or Erect / Re-Erect of a Building or Any Plot of Land covered by master plan.